My latest project comes in the form of a box. Well, boxes to be exact. I remember these boxes from growing up; it's where freshly developed photos went after having been looked at once. Occasionally a photo made it to an album... which also lived in the same box. It never made much sense to me then, and now as I'm going through them it makes even less sense. But I can understand why this came to be. You shoot your roll of 24 exposures, then get them developed. At this point you need to catalog them, label them with the date, place, and who is in them. Then, the good ones get put in an album where you caption them. As I look at the albums I can see my parents were pretty good about it for the first couple years. Then, when my younger sister came along I was either sharing the camera lime-light with her, or there weren't that many "good" shots of me. The album is pretty good though until the age of 12, where it ends. I assure you though, there are plenty of photos to document me post 12 years. It's no wonder why digital photography has been huge. Never mind how it allows you to shoot as much and as often as you like, without having to worry about developing film, but it tags your photos with the date and time, and in some cameras you can also get the location and people in the photo. These photos of me growing up are fun to look at, but I have to wonder about the film quality. 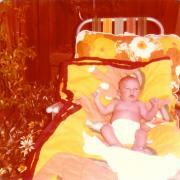 The photos from the late '70's (when I was born) aren't holding their color all that well, unless a sepia tone was applied to all photos back then. Honestly, they're just above monochrome. Obviously as we move through the years and get to newer photos their colors are still bright and vibrant. One thing I do like about the older photos are their square shape. To give you an idea of the quality of the shots here's a picture of me. The one on the left is the scanned original, and the one on the right I spent 10 minutes on in Aperture to bring more life to it. I'm always a little amazed when I see the corrected photo; I feel like I brought it back to life. But, 10-20 minutes per photo wasn't something I really wanted to do, even if I am automating parts of it. And if 1970's photos were bad, I didn't want to think about the photos I knew were in another box that had photos of my dad and his family. From back in the 1920's! So yesterday I opened that box, and I was pretty surprised. Obviously the photos are monochrome, but the quality of them, for the most part, is quite good. 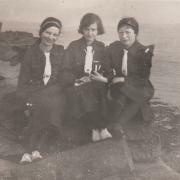 The photo on the left was taken in 1924 and features my grandmother (on my dad's side, for those of you keep track) in the middle. There's a lot of dust, that I can take out digitally, but you can still see a lot of detail, especially when you consider this is 86 years old. 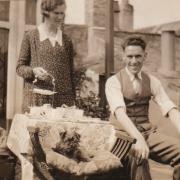 The next photo is of my grandparents (again, dad's side) with dog from, guessing here, about 1934/35. The detail still visible in the dog (you can see the glint in it's eyes!) is pretty impressive. Both photos are straight out of the scanner with no post editing work done. The biggest problem with working with these older pictures will be the dust removal which can only be done manually. But even more difficult has been working with my dad's memory! If you're thinking about doing something similar, my advice to you is to start sooner than later, especially if you don't personally know your family beyond your parents.